This article is about the French brother for whom La Salle University is named. For the French explorer of that era with the same surname, see René-Robert de La Salle. 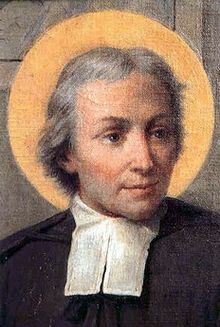 Saint Jean-Baptiste de La Salle (April 30, 1651 – April 7, 1719) was a French priest, educational reformer, and founder of the Institute of the Brothers of the Christian Schools. He is a saint of the Catholic Church and the patron saint for teachers of youth. De La Salle dedicated much of his life to the education of poor children in France; in doing so, he started many lasting educational practices. He is considered the founder of the first Catholic schools. De La Salle was born to a wealthy family in Rheims, France on April 30, in 1651. He was the oldest child of Louis de La Salle and Nicolle Moet de Brouillet. Nicolle's family was a noble one and ran a successful winery business and she was a relative of Claude Moët, founder of Moët & Chandon. La Salle received the tonsure[clarification needed] at age eleven and was named canon of Rheims Cathedral when he was sixteen. He was sent to the College des Bons Enfants, where he pursued higher studies and, on July 10, 1669, he took the degree of Master of Arts. When De La Salle had completed his classical, literary, and philosophical courses, he was sent to Paris to enter the Seminary of Saint-Sulpice on October 18, 1670. His mother died on July 19, 1671, and on April 9, 1672, his father died. This circumstance obliged him to leave Saint-Sulpice on April 19, 1672. He was now twenty-one, the head of the family, and as such had the responsibility of educating his four brothers and two sisters. He completed his theological studies and was ordained to the priesthood at the age of 26 on April 9, 1678. Two years later he received a doctorate in theology. The Sisters of the Child Jesus were a new religious congregation whose work was the care of the sick and education of poor girls. The young priest had helped them in becoming established, and then served as their chaplain and confessor. It was through his work with the Sisters that in 1679 he met Adrian Nyel. With De La Salle's help, a school was soon opened. Shortly thereafter, a wealthy woman in Rheims told Nyel that she also would endow a school, but only if La Salle would help. What began as an effort to help Adrian Nyel establish a school for the poor in De La Salle's home town gradually became his life's work. At that time, most children had little hope for social and economic advancement. Jean Baptiste de La Salle believed that education gave hope and opportunity for people to lead better lives of dignity and freedom. Moved by the plight of the poor who seemed so "far from salvation" either in this world or the next, he determined to put his own talents and advanced education at the service of the children "often left to themselves and badly brought up". La Salle knew that the teachers in Reims were struggling, lacking leadership, purpose, and training, and he found himself taking increasingly deliberate steps to help this small group of men with their work. First, in 1680, he invited them to take their meals in his home, as much to teach them table manners as to inspire and instruct them in their work. This crossing of social boundaries was one that his relatives found difficult to bear. In 1681, De La Salle realized that he would have to take a further step – he brought the teachers into his own home to live with him. De La Salle's relatives were deeply disturbed, his social class was scandalized. When, a year later, his family home was lost at auction because of a family lawsuit, De La Salle rented a house into which he and the handful of teachers moved. La Salle decided to resign his canonry to devote his full attention to the establishment of schools and the training of teachers. He had inherited a considerable fortune, and this might have been used to further his aims, but on the advice of a Father Barre of Paris, he sold what he had and sent the money to the poor of the province of Champagne, where a famine was causing great hardship. De La Salle thereby began a new religious institute, the first one with no priests, at all, among its members: the Institute of the Brothers of the Christian Schools, also known as the De La Salle Brothers (in the United Kingdom, Ireland, Malta, Australasia, and Asia) or, most commonly in the United States, the Christian Brothers. (They are sometimes confused with a different congregation of the same name founded by Blessed Edmund Ignatius Rice in Ireland, who are known in the U.S. as the Irish Christian Brothers.) The De La Salle Brothers were the first Roman Catholic teaching religious institute that did not include any priests. De La Salle's enterprise met opposition from the ecclesiastical authorities who resisted the creation of a new form of religious life, a community of consecrated laymen to conduct free schools "together and by association". The educational establishment resented his innovative methods. Nevertheless, De La Salle and his small group of free teachers set up the Institute of the Brothers of the Christian Schools which is, according to the La Salle Web site, entirely dedicated to the Christian education of the "children of artisans and the poor", in a life close to that of the Catholic religious. In 1685, De La Salle founded what is generally considered the first normal school — that is, a school whose purpose is to train teachers — in Rheims, France. Worn out by austerities and exhausting labors, De La Salle died at Saint Yon, near Rouen, early in 1719 on Good Friday, only three weeks before his 68th birthday. Pope Leo XIII canonized De La Salle on 24 May 1900 and Pope Pius X inserted his feast in the General Roman Calendar in 1904 for celebration on 15 May. Because of his life and inspirational writings, Pope Pius XII proclaimed him patron saint of teachers on 15 May 1950. In the 1969 revision of the Church calendar, Pope Paul VI moved his feast day to 7 April, the day of his death or "birth to heaven", his dies natalis. De La Salle was a pioneer in programs for training lay teachers. Of his writings on education, Matthew Arnold remarked: "Later works on the same subject have little improved the precepts, while they entirely lack the unction." His educational innovations include Sunday courses for working young men, one of the first institutions in France for the care of delinquents, technical schools, and secondary schools for modern languages, arts, and sciences. The LaSalle University says that his writings influenced educational practice, school management, and teacher preparation for more than 300 years. As of 2017[update] about 3,800 brothers and 92,000 lay and religious colleagues worldwide were serving as teachers, counselors, and guides to 1,000,000 students in over 1,500 Lasallian educational institutions in 82 countries. A number of streets have been named after De La Salle, generally due to the presence of a Lasallian School. These include: La Salle Avenue in Bacolod, Philippines (where the University of St. La Salle and St. Joseph School-La Salle are located), the La Salle Street in the Cubao neighborhood of Quezon City, and also one in Mandaluyong City. There is also De La Salle Avenue in St. Louis, Missouri, La Salle Road in Towson, Maryland, and La Salle Road in Hong Kong. In Malaysia, where there are 44 La Salle schools, in the state of Penang is a road named Jalan La Salle after a school there.. In Mexico, one station of the Mexico City Metrobús is named after De La Salle. Hundreds of educational institutions around the world are named after de La Salle. The De La Salle schools form a 300-year-old network in 80 countries following La Salle's principles. ^ Van Grieken, G. (1995). To Touch Hearts - Pedagogical Spirituality and St. John Baptist de La Salle (Doctoral dissertation). Boston College, Chestnut Hill, Massachusetts. ^ a b Graham, Matthias (1910). "St. John Baptist de la Salle" . In Herbermann, Charles. Catholic Encyclopedia. 8. New York: Robert Appleton. ^ Wanner, R., Claude Fleury (1640-1723) as an Educational Historiographer 1975 "No survey of French education in the seventeenth century would be complete without reference to the educational work of Jean-Baptiste de La Salle." ^ a b "St. John Baptist de La Salle", Lives of Saints, John J. Crawley & Co., Inc.
^ Koch, Carl (1990). Praying with John Baptist de La Salle. Saint Mary's Press. pp. 49–50. ISBN 9780884892403. ^ "Saint Jean-Baptiste de La Salle". La Salle France. 2016. Retrieved 21 January 2019. ^ a b "Discover the Priesthood", Diocese of Jefferson City, Missouri at the Wayback Machine (archived October 29, 2013). Archived from the original on 2013-10-29. ^ "Page:Catholic Encyclopedia, volume 8.djvu/513". Wikisource. Retrieved 14 April 2019. ^ "Línea 2: significado de estaciones". ^ "De La Salle: Institutions and Activities". lasalle.org. Archived from the original on 1 June 2009. Van Grieken FSC, George, "Touching the Hearts of the Students: Characteristics of Lasallian Schools", Christian Brothers Conference, 1999. Koch, Carl; Calligan FSC, Jeffrey; Gros, Jeffrey, "John Baptist de La Salle: The Spirituality of Christian Education", Paulist Press, 2004. Calcutt FSC, Alfred, "De La Salle: A City Saint and the Liberation of the Poor Through Education", De La Salle Publications, Oxford. 1993. Wikimedia Commons has media related to Jean-Baptiste de La Salle.